Hi! My name is Linda Hobkirk. I am someone who has always believed customer service and relationships are an important part of life. I chose to become a REALTOR® over 17 years ago. I knew I could provide people with exceptional service, honesty and a commitment to help them find a place to call home. Each day I am thankful that I have the opportunity to help families obtain their dreams of home ownership. With so much confusion in the housing market at this time; you need someone you can trust and rely-on. I am a wife, a mother and a grandmother of twin 20 year old grandsons, a darling 9 year old granddaughter, and a wonderful 19 year old step grandson! Time flies by so quickly these days. In my spare time I enjoy riding motorcycles, learning techy stuff, reading good books, gardening, cooking, spending time with my family and friends! Call me if I can help you with any real estate questions in Northwest Arkansas. "Linda was also simply amazing at mentioning little things we may not have otherwise thought of"
Linda was recommended to my husband and I by several of his coworkers, and it was so easy to see why after just our first meeting. 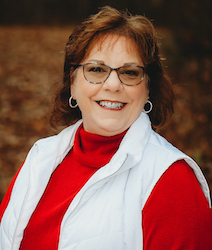 She is extremely knowledgeable about Northwest Arkansas and wasn’t afraid to tell it how it is (which we really needed sometimes – like when she told us it was probably time to walk away from a home we loved but was presenting us with a lot of red flags). She told us that sometimes things don’t work out for a reason, so that we can find something better for us. She was so right! As this was our first home-buying experience, she was great about helping us navigate through all the steps in the process that were very foreign to us. Linda was also simply amazing at mentioning little things we may not have otherwise thought of and was also very prompt about answering any emails/texts as best she could and putting in a lot of work to get more information for us. Even after we’ve closed on the house, Linda has stayed in contact to check in and make sure everything is going well for us. We would both highly recommend Linda to anyone looking to purchase a home in Northwest Arkansas. She is professional, fun, and determined to make your home buying experience a great one!